Is SEO dead? Not exactly. The era of being able to successfully get to the top of Google with smoke and mirrors is definitely over. We’re now in an era where quality content creation reigns supreme, and search engines are increasingly taking social signals into account to judge the quality and relevance of content. That being said, keyword research still matters. Given that 89 percent of consumers still head straight to Google, Bing, or Yahoo to search for branded product or service solutions, a keyword strategy is a tool to ensure your company is ranking well. There are about a million factors that affect the queries driving the largest volume of search. Terms like “Halloween costumes for kids” peak in October. However, your industry is likely as vulnerable to trends as any other. Google Insights for Search is a free and magical tool for discovering how your keywords are faring over time, and capturing top rankings for the next big thing in your niche. Just like fashion trends and top 40 hits, buzzwords and jargon peak in popularity, and then quickly disappear into anonymity. The term “Web 2.0” has virtually disappeared, while it was all the rage two years ago. 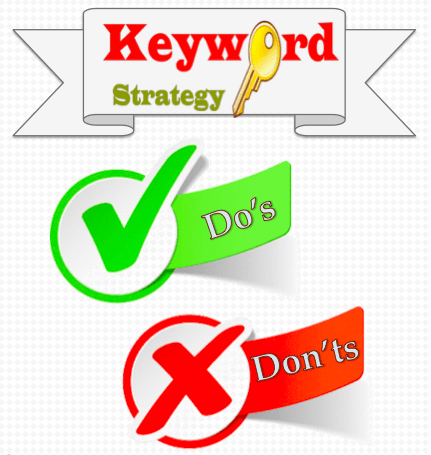 There is a place in your keyword strategy for jargon, but it shouldn’t reign supreme. As HubSpot’s Corey Eridon points out, “[buzzwords] should be balanced with...variations of keywords that people use when they don’t know exactly what you’re looking for.” Include red hot language, but ensure your keyword research includes terms used by people of all levels of expertise. Even the most brilliant content marketing strategy can fall short if you’re not targeting terms that people are actually searching for. Tracking search volume of keywords through a tool like Google AdWords, HubSpot or Marketo is critical to make sure you’re not just optimizing for the way you and your coworkers talk about your product. If your keyword queries return only a few dozen searches a month, you’ll likely see some pretty limited success. Aim for the highest search volume possible, and a difficulty score under 70 for best results. Is the optimal keyword density for content 1.0%, 2.0%, or higher? Actually, the answer is none of the above. Google’s Matt Cutts advises content marketers to write naturally, and worry more about creating something brilliant than how many times they incorporate their long tail keyword. If your copy seems unnatural or repetitive, your keyword density is definitely too high. Any successful marketing strategy should include an element of competitive analysis, which is regular research on how your company stacks up against other brands in your niche. That being said, it pays to be cautious on just how you research your competition’s SEO efforts. Google’s terms of service prohibit automated search queries from SEO tools, meaning you can’t rely on a piece of software to generate reports on whether you or your competitor are ranked better. The most ethical way to discover the information you need is manually. Sign out of your Google account to ensure your results aren’t skewed, and regularly check your competitions’ top rankings for key search terms. Prior to 2009, SEO was a bit like the wild west. One common tactic was hiding text and links by using a font that matched the page background, or through more complex methods. Hidden text is no longer smart, and it can get your page slammed with negative SEO. Google’s Matt Cutts was recently awarded an official patent for a tool that specializes in sniffing out hidden text. Google, Bing, and Yahoo are pretty smart - but they’re not yet smart enough to index images. Instead, search engines rely on Alt Text for determining the intent of your image. Be sure to incorporate keywords into your image tags to avoid confusing search engines about the context of your content. Is it true that marketers ruin everything? In the case of Meta Tags, it certainly is. Due to rampant abuse of meta data in years past, major search engines no longer rely on the information for indexing or ranking. It’s still prudent to include meta tags, because minor search engines use them, but don’t invest too much time and effort into the process. Region doesn’t just affect the way people talk. It also affects the way people search. Whether you business is local, or targeting a specific market, it’s wise to use Google’s Keyword tool to filter your searches by location. In case you haven’t noticed by now, Google is on to antiquated, sneaky SEO tactics. This includes anchor text, the process of using keywords in the text of web pages to support links. Use, but don’t abuse this tactic - repeatedly linking the same keyword to contain a link to an internal or external web page can make your website look pretty fishy to search engines. Unless your content goes viral and racks up about a million social media shares, you probably won’t rank at the top for a keyword after just one blog post. Use and reuse keywords, particularly if you’re targeting a term with high difficulty. Competition can be fierce for common search terms, and while it’s critical to ensure your content marketing strategy includes variety, keep trying to rank for the highest search terms until you succeed. It’s definitely a best practice to incorporate multi-media content into your web marketing strategy. Videos and infographics are optimized for social media sharing, and can improve inbound links and page stickiness. However, ensure these files are search-friendly by including a keyword-rich video transcript on the page, or penning some text to support your infographic. Checking your keyword rankings daily is certainly attentive marketing, but the most likely outcome is some serious stress. Your rankings can fluctuate daily according to any number of top-secret factors woven into major search engine’s algorithms, so it’s best to track success weekly or monthly. The worst thing you can do for your website’s SEO is to treat keyword research like a one-time job. Search algorithms change, industry trends shift, and people start using different queries to find your product. Build time into your schedule to research keywords monthly, and incorporate into your content calendar. While keyword strategy can feel like just another element to be added to a busy content creator’s schedule, researching SEO can be critical for capturing the attention of today’s consumer. Use keyword research to discover trends, speak in your prospects’ language, and beat your competitors to the top of Google. How has your keyword strategy shifted over the past few years? Aw, this was a Quite positive report. Getting the year and serious energy toward generate a beneficial post… yet what can I say… I be reluctant a complete whole lot and have on’t find the money for in direction of just take almost everything performed. Excellent job on the deliver up! I expect inside steering of examine out examine all through added to by yourself!